Did you read Something Real by Heather Demetrios last year? It was one of my favorite books of 2014. It was about a family reality show called The Baker's Dozen. A family with 12 kids - more Jon & Kate than the Duggars. The main character was Chloe, one of the children who no longer wanted to play a role in her family's TV show or in public life at all. 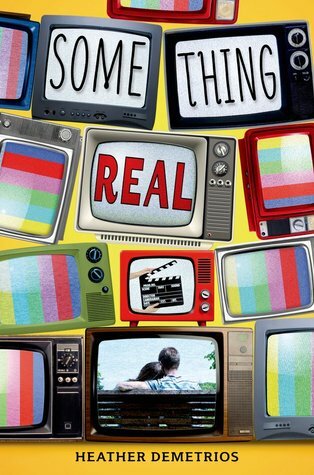 Something Real is a book that I expected to be shallow and nothing but fluff. It turned out to be much more substantive. It's a hard hitting realistic look at the downside of fame and at a severely dysfunctional family. And yet it is immensely readable. It manages to be funny, sad, touching, uplifting, and infuriating without feeling maudlin. I was browsing blogs a few days ago, and to my great surprise, read a post about The Lexie Project, a companion novel to Something Real. In a unique twist, The Lexie Project is being published for free on Wattpad and will incorporate other media platforms, such as Twitter, Instagram, Tumblr, and more. I am so excited about this! Having a multimedia book (and a free one, at that) feels like a fresh concept. It's perfectly in keeping with the reality television scene. And also reminiscent of popular series like The Lizzie Bennet Diaries. There will be a crowd-sourcing element to The Lexie Project, which is even better. How often do you feel like you're a part of the book you're reading? It's like Choose-Your-Own-Adventure for the 21st century. The first three chapters went up on June 8. A new chapter will be posted each week for the next year. I'm on chapter 4 right now and can't wait to see how this story turns out! Check out The Lexie Project and let me know what you think! Ohhhh, I should really check this out!